1985 O-Pee-Chee WWF Pro Wrestling Stars is one of the key wrestling card sets ever produced. While some of it mirrors the Topps set released around the same time, Canadian collectors got a second series with new cards. The first series has 66 cards. Series 2 is even bigger, expanding to 75 cards. Each series has its own set of numbers. 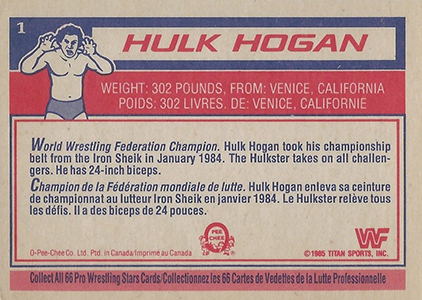 Subjects include a mix of wrestler profiles, action cards and Superstar Speaks cards. This instantly recognizable subset takes shots from the Tuesday Night Titans talk show spoof and adds speech bubbles. The designs were later used as the basis for 2012 Topps WWE Heritage. The cards are virtually identical to their Topps cousins. The main difference can be found on the back where the text is in both English and French. O-Pee-Chee is also noted in the copyright data. Series 2 does have a slightly different design. Backs for the profile cards go from having an illustration to a small photograph. The layout and color schemes are also very different, although the information is similar. 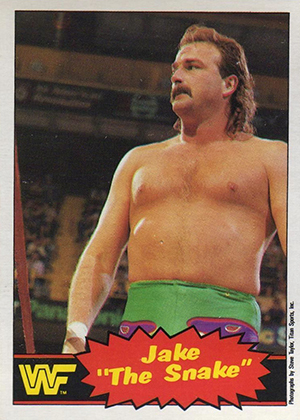 This is one of the first WWF-licensed trading card sets. 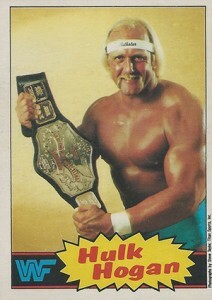 In the first series, cards featuring Hulk Hogan and other top stars can carry a premium. 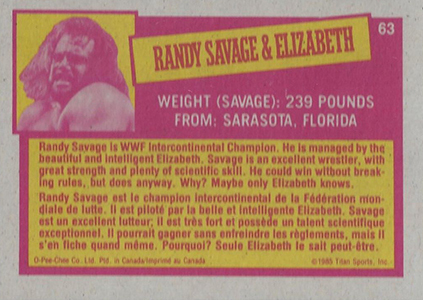 Series 2 includes the cardboard debuts of many wrestlers, most notable "Macho Man" Randy Savage. 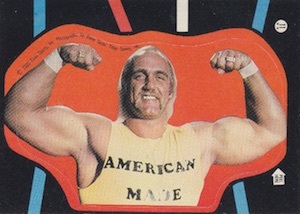 Like the American version, 1985 O-Pee-Chee WWF Pro Wrestling Stars also includes sticker inserts. Series 1 = 66 cards. Series 2 = 75 cards. 22 Let Go of My Toe! 25 Going For The Midsection! 26 Up in the Air! 29 Stretched to the Limit! 31 An Appetite for Mayhem! 33 Smashed on a Knee! 34 A Fist Comes Flying! 35 Lemme' Out of This! 37 Attacked By An Animal! 42 Ready for a Pile Driver! 43 Face To The Canvas! 44 Paul Wants It All! 45 Kick to the Face! 47 Putting on the Squeeze! 52 Going For The Pin! 55 Fury Of The Animal! 56 Wrong Kind Of Music! 26 The Dragon Has Struck! 35 This Is Gonna' Hurt! 45 Iran and Russia - Number One? 60 The Animal in Love! 75 Ready For A War!